When I was a wide-eyed little bloke with shirt tails that wouldn’t stay tucked in, and shoelaces that refused to stay done up, a beatific Presentation nun undertook one day to explain to me what "eternity" was. "Imagine a solid steel ball as big and round as the earth," she said. "And imagine that every ten thousand years an eagle flies by and brushes the steel ball with its wing. When the eagle has worn away that entire ball of steel," she concluded with saintly breathlessness, "eternity would only just be beginning." Well, the only answer to that is, "Bloody hell!" but I wasn’t equipped with such ripostes in grade four and no doubt I was suitably inspired to hit the moral straight and narrow, just as she had intended, because to land in the wrong place for an eternity like that would be, as Phillip Ruddock might say in one of those immoderate, passionate outbursts for which he is well known, "inappropriate". 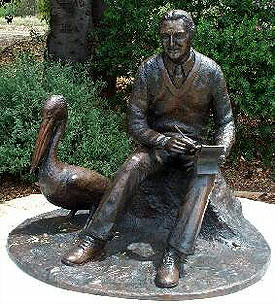 But that image of the brushing wing—the ghostly eagle cruising through time’s ethereal dominions on his ten thousand year circuit to flick imperiously at the shining steel (in later years I have seen the eagle as a Wedge Tail)—often comes back to me, not as its intended warning about the longueurs of eternal damnation, but as a metaphor for the machinations of fate. Let me explain. A couple of weeks ago, towards the end of a cold, rigorous Clare Valley winter, during which frost after white frost had scythed through fragile plants and the kangaroos and wild ducks had decided that our pea straw mulch had been put there for them to nestle into, the higher power declared that we had earned a break. We went to Port Douglas. After the shortest week in Time’s quiver and daily temperatures of 28 to 30 degrees under flawless blue skies, we found ourselves back on the shuttle bus bound for Cairns airport and home. And as we left Port Douglas we passed Steve Irwin’s caravanserai going the other way. I didn’t actually hear the brushing wing of fate at the time, but a few days later I realised that its eerie warning must have sounded. If I could have glimpsed the bigger picture, from eagle height, for example, I would have seen our path crossing one that was doomed. Very sobering. From eagle height, though, I might have also seen in another part of the big picture how my path crossed intricately and several times with Colin Thiele’s. 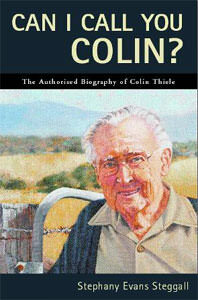 Years ago, with a colleague, I wrote a series of radio broadcasts for the ABC on Thiele’s life and work. It was the first such commission either of us had ever received, and we expended a great deal of cask red and early morning hours trying to do it justice, though in the end a fair enough result was undercut by being too rushed. When Colin Thiele asked to meet us, having previewed the broadcasts, we regretted our haste even more because he was such a magnificently civilised, intelligent, insightful human being. With great gentleness, he speculated on some of the things we might have been more interested in and on some of the ways in which he felt his work might warrant more profound recognition. We didn’t feel in the slightest degree rebuked; on the contrary, neither of us ever forgot that meeting or the man, and his eventual towering presence as a writer and educator came as no surprise at all. My path would "cross" Colin Thiele’s again when, looking for our dream in the mid north of South Australia, the higher power and I very nearly bought land at Eudunda, Thiele’s birth place, as I was pleased to point out to the real estate bloke. Thiele and Irwin died within a week of each other. The Prime Minister said that Irwin died a "quintessentially Australian" death while Colin Thiele, whom Howard never mentioned, died of a heart attack in Brisbane where he and his wife had moved some years ago to be near their grandchildren. Never grandstanding, diffident to a fault, proud of his Barossa Deutsch heritage, as Australian as the mid north landscapes that he grew up in, immensely gifted yet modest about it, Colin Thiele was quintessential, not the tragically unlucky, fate-tempting Irwin. But in a philistine nation under philistine leadership, Thiele’s quiet cultured tone and its sad silencing could not compete for proper, courteous and deserved recognition with the phony vernacular outpouring that is supposed to be our true voice. At a time coincidentally of renewed and heated debate about our history, fate—that imperturbable, circling eagle?—presented the nation with an opportunity to recognise our true heroes and our authentic voice, and our loudest official spruikers duly failed the test. I too was saddened that Colin Thiele had to take third place in the memorial stakes, but its our own doing isn't it? Our addiction to success in the seconds of life blinds us to the gift in the years. In my fifties now, my copy of 'Storm Boy' which I read to my class in the 1970's still has a special place on my bookshelf while many a title has been donated to Lileline book fairs. Colin Thiele helped shaped the views of generations of young Australians towards the critical issues facing their environment with his thoughtful, gently persuasive writing. I'm not sure if he ever needed to use the word "crikey". A fine tribute to a quiet Australian. There are many such Australians who work quietly and achieve highly. Many outstanding scientists, artists and writers come to mind. Their legacy will be recognition not just by those of us alive today but by generation after generation.